The Express Employment Professionals franchise in Lakeland, FL was purchased by C.J. Marcello in April of 2013. The office has grown steadily since then, and continues on our path to excellence in our work as an Express Franchise. Every day, we help Job Seekers find work and help Employers find qualified employees. As the largest privately-held staffing company in the United States, we're locally owned but globally powered! Founded in 1983, Express today employs 566,000 people across over 800 franchise locations worldwide. Our long-term goal is at the heart of our company's vision, to help as many people as possible find good jobs by helping as many clients as possible find qualified employees for their businesses. 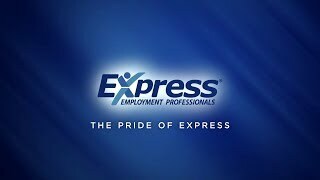 Serving predominantly the Polk County area, we at Express Lakeland are always looking for exceptional candidates who are seeking a new or better career. We have become known as a reliable resource for numerous businesses throughout our community. We get to know our clients individually through strong relationships and have come to understand their industries, challenges, and skills sets needed to provide them a "just in time" workforce. Our staffing solutions include temporary, evaluation-hire, flexible staffing, short or long-term contract staffing, and professional recruitment/placement in a variety of fields. We make it our goal to pair talented Job Seekers with exceptional Employers in the Lakeland area. We work hard to assist our community, and it all starts with you. We are only successful if you succeed, therefore, you can rely on us to help you with your unique employment situation. Companies benefit from our services by having the advantage of our comprehensive and tailored strategy that we design specifically for your employment needs. Our detailed, yet quick candidate recruitment process aligns the needs of your business with the talents and skills of the workers we employ, to give you an effective workforce when it matters to you! Associates who trust us with assisting them in their job search can feel confident in our ability to place them with the right Employer through our four-step hiring process which finds the ultimate selections of local jobs that fits their needs. Our ongoing educational opportunities, such as our free webinars and annual Leadership Simulcast, are designed to provide relevant information to our clients. Our topics range from "Employee Morale and Engagement", " Conflict Management", "Communicating With and Getting The Most From Your Employees" - all FREE. Our Lunch 'N Learn programs can be done in your office and cover a variety of topics such as "How to Be the Employee Your Employer Can't Live Without", "Generations in the Workforce", "Learn to Lead", as well as others - are also FREE. Let us meet your hiring needs as your choice staffing agency in Lakeland, FL! Contact Express Lakeland and Experience the Difference! Visit Our Express Office in Lakeland Today!